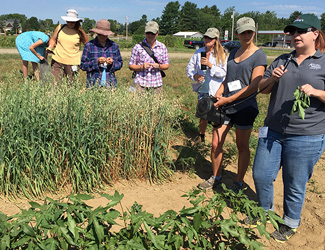 Waterville, Maine: August 5–8, 2016 — Johnny's Selected Seeds greeted the fifth annual Student Organic Seed Symposium (SOSS) with a full-day tour of its research farm and facilities in Albion and Winslow. 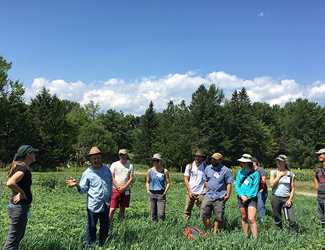 From their base at Colby College, a group of 50 students and global leaders in organic plant breeding systems attended an intensive, four-day series of lectures, panel discussions, and field trips crisscrossing rural Central and Down East Maine. 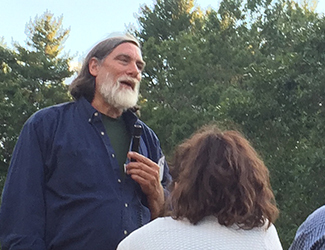 "Johnny's was happy to help host the SOSS conference in Maine this August," said company Chairman and Founder, Rob Johnston, Jr. "SOSS, the Student Organic Seed Symposium, is a great example of a good idea: a conference of graduate students in organic plant breeding, their professors, and industry people like me. And, it is remarkably put together each year by the students themselves. The conferees, especially the students, are a vital part of building a healthier food system." Lindsay Wyatt, a plant breeder at Johnny's specializing in squash and pumpkins, is a prime case in point. Wyatt, who first helped host the 2014 conference as a Cornell grad student, was pleased to participate in the planning as a professional this year. "Most agricultural schools today have a strong Big-Ag focus, and while studying for my PhD, I was struggling in my plans. Involvement in the symposium validated and reinvigorated my interest in applied, hands-on breeding of vegetable crops. That was an important turning point in my life that led to my work here at Johnny's." " The Friday tour of Johnny's was … incredible! … To see the inner workings of a seed company and having representatives from all aspects were what made it so special… The student trial plots were beautiful, and a huge asset to the conference. " Growing out and tending the grad students' trial plots was another way in which Johnny's was able to contribute this year. The demonstrations have become a favorite part of the conference, as they are designed to highlight students' research, and allow them to engage in dialogue about their work with peers and professional cohorts. "Students from diverse geographic regions sent all sorts of crops not usually grown here in Maine," noted Wyatt. "One of the more interesting crops this year was cotton, sent by Texas A&M grad student Heather Elkins — we may even get a flower or cotton boll or two before frost." Elkins is working in organic cotton breeding to develop a unique leaf shape that assists in making GMO contamination more readily apparent. Demand for organic cotton fiber is rapidly on the rise, and 90% of organic cotton derives from the high plains region of Texas, but approximately 90% of all cotton grown in Texas is genetically modified . This litigious scenario places organic producers at extreme risk of contamination, and resultant loss of their organic certification. Among other benefits, the advancement could help growers of all methods more peacefully coexist. Another crop capturing the group's attention was organic watermelon. University of Georgia grad student Suzanne Stone's breeding work focuses on producing cultivars that generate good size fruits on much more compact vines. This development will not only help increase yield per acre, but facilitate inter-row weeding and cultivation, as the aboveground portion of the plants stays neatly on the plastic mulch.
" Our group interactions at SOSS this year were among the best since I first attended this symposium four years ago. The conversations with the plant breeding grad students around our classical breeding projects at Johnny's were very lively and got everyone's creative juices flowing! " Solveig Hansen is a grad student working on genetic aspects of flavor and culinary quality in organic table beets at the University of Wisconsin . An area of her research is geosmin, the volatile phytochemical that gives beets their earthy flavor or "mustiness." Symposium participants were intrigued to learn how evaluation of differences in taste can be made through plant breeding and genetic studies, and reported a distinct difference in flavor between the beets from her high- and low-geosmin plant populations. A pantheon of heroes from the global participatory plant breeding and sustainable seed systems arena formed the 2016 speakers roster , ranging from Maine's Jim Gerritsen and Neil Lash to Rodale Chief Scientist Kris Nichols , Canadian Seed Security's Jane Rabinowicz , and other luminaries. Rabinowicz spoke of her role as Director of the Bauta Family Initiative, and of her prior position as well, as director of Santropol Roulant . This intergenerational community food hub is predominantly run by a staff of dynamic young volunteers. One of the primary services they provide is the preparation and delivery of meals to Montréal's elderly — similar to Meals on Wheels, with whom they collaborate — only using fresh, local vegetables and organic meats. Her five magic words — coherence, expression, reciprocity, service, and joy — made me think about Johnny's mission, how we are ultimately striving to serve and strengthen communities. It is important for us to be always thinking about stakeholders, treating people with respect, identifying ways to do things that are going to benefit our target audience. In certain ways our work aligns with that of the Bauta Family Initiative in Canada, which is working to increase national seed systems and food security: conducting trials, supporting growers, and learning how to best grow seeds. Dr. Rabinowicz's service-minded view of seed work is what strikes me as truly important. Janny van Beem of the Global Crop Diversity Trust spoke of her work to develop and implement gene bank quality and risk management systems, helping plant gene banks globally to remain productive and intact. Much of the organization's work takes place in countries with scant infrastructure, developing backup plans for natural disasters, saving genetic materials, providing grants, building generators, and generally maintaining and securing higher and better conditions for genetic resources in gene banks worldwide. A thought-provoking panel discussion on advocacy for organics at the policy level was led by Kiki Hubbard, Director of Advocacy and Communications for Organic Seed Alliance , and Bill Tracy, Clif Bar Family Foundation – Organic Valley Professor of Organic Plant Breeding, and chair of the Department of Agronomy at the University of Wisconsin–Madison . "Seed work is slow work; policy work is much, much slower," was one of the realities Hubbard and Tracy stressed to the group, noting that much of that work can be advanced simply through "education and telling the story of your successes." An important part of what we're trying to do at Johnny's is tell the stories behind our seeds and tools — which is part of a much broader community effort to educate the public about research and breeding for organics. Despite the painfully slow pace of change Kiki and Bill have witnessed in Washington during their careers, they described some of the progress they've made, and emphasized that 'sometimes all you have to do is show up' to be a voice for the organic community, so that it can be heard. This can be as simple as answering a question, being a resource, or just giving examples of what is working in the organic community. Having the opportunity at this SOSS event to see some of the students' breeding projects and share our work at Johnny's was a powerful way to foster this type of cross-pollination of ideas and information, and will no doubt lead to some 'new seeds' that help this community grow at all levels. 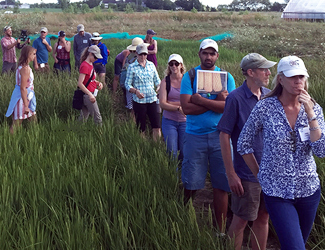 Excursions punctuating the symposium included a tour of Wildfolk Farm , on the Benton–Clinton town line, where they were impressed by the scientific and inquisitive nature of the first commercial rice venture in Maine. "This is what all growers do," noted Wyatt, "but they are taking it one step further by experimenting with cultivated rice in Maine" — known for its hard winters and short summers — "to bring something novel to the local food system." Johnny's pitches in to the Maine Rice Project by lending the group seed-cleaning equipment. Trips farther afield included a tour of the traditional grist mill at Maine Grains in Skowhegan, where an emergent network of local organic grain producers is helping to make Central Maine one of the country's burgeoning rural food hubs. Capping the symposium was a tour of Four Seasons Farm in Harborside, where hosts Clara Coleman, Eliot Coleman, and Barbara Damrosch wowed the group with their immaculate artichoke fields and polyfarming ingenuity. A discussion of organic seed systems as a whole led by the Colemans lent the grace note to four solid days of soaking in new knowledge, broadening and strengthening community, and creating a healthier future for all. Established in 1973, Johnny's Selected Seeds is a 100% employee-owned company and purveyor of high quality seeds and tools. Johnny's is committed to a grower's success and provides superior products, information, and service. Johnny's products are 100% guaranteed.